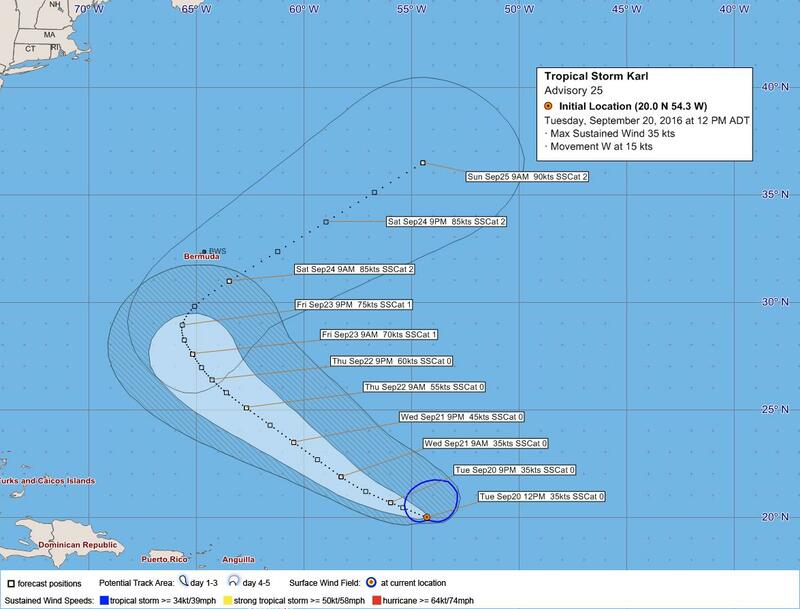 [Updated] Tropical Storm Karl is a “potential threat to Bermuda,” the Bermuda Weather Service said this evening, and its closest point of approach to Bermuda within 72 hrs is forecast to be 374nm to the south-south-east at 6pm on Thursday, Sept 22. Minister Baron said this evening, “Although this storm is some distance away from Bermuda, we are paying close attention to its development. “A meeting of the Emergency Measures Organisation [EMO] is likely to be convened this week to confirm our preparations are in order and to ensure we communicate that to the people of Bermuda. 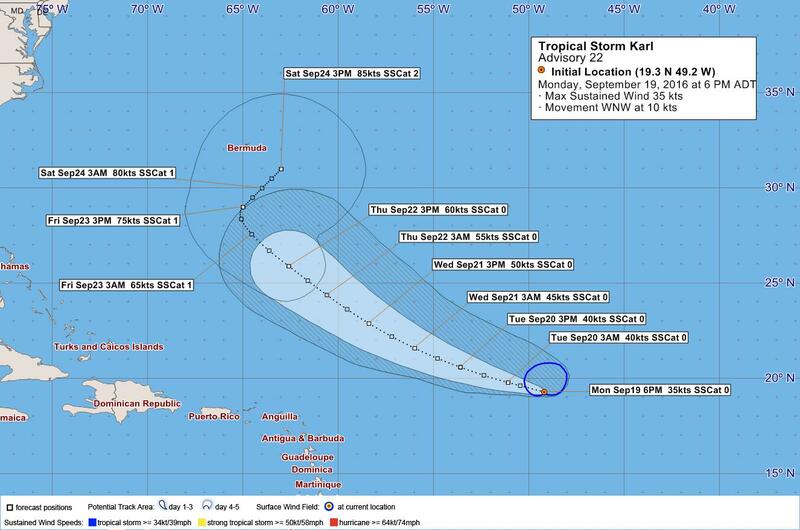 The latest forecast from the U.S. National Hurricane Center said, “Karl is moving toward the west-northwest near 12 mph [19 km/h], and this general motion is expected to continue through Wednesday. “Maximum sustained winds are near 40 mph [65 km/h] with higher gusts. Some strengthening is forecast during the next 48 hours. Update Sept 20, 12.26pm: The BWS continue say that Karl is a “potential threat to Bermuda,” with their latest forecast saying its closest point of approach to Bermuda within 72 hrs is forecast to be 257nm to the south at 12pm on Friday, Sept 23.
be sure to stack up on beer ,ice, and a flashlight. If you’re so great, why don’t you tell us what this storm will do? How, they said that Fahy was a tropical storm and ended up being a hurricane. So you are saying you can’t remember how to spell Fay? All I had to see were the words irrelevant and comment in the same sentence and I instantly knew you were talking about Onion Juice! Seems as if I will have to get Vice Commodore Double Seven Single Nine and Union Man Quad Dueces to secure my yacht and estate while I jet out on the Learjet for the storm. Check on seniors ans shut their shuttsrs… Make sure theie safe. 000 WTNT42 KNHC 200858 TCDAT2 TROPICAL STORM KARL DISCUSSION NUMBER 24 NWS NATIONAL HURRICANE CENTER MIAMI FL AL122016 500 AM AST TUE SEP 20 2016 Karl’s satellite appearance late yesterday gave the impression that it had increased some in organization, with the low-level center partially underneath a large mass of deep convection. Since that time, the low-level center appears to have outrun the convection, becoming exposed well to the west of the remnant convective mass whose cloud top temperatures have warmed significantly. The cloud pattern is typical of a tropical cyclone undergoing significant westerly shear. Dvorak classifications have decreased to T2.5 from TAFB and SAB, and on this basis, the initial intensity estimate is lowered to 35 kt. The initial motion is a faster and a more westerly 290/15. Karl should continue to be steered generally west-northwestward around the southwestern periphery of well-defined low- to mid-level subtropical ridge over the central Atlantic during the next couple of days. The cyclone should move into weakness in the ridge along 65W in 48 to 72 hours, which should result in a gradual turn toward the north with a considerable decrease in forward speed by day 4. Around 96 hours, Karl should become susceptible to the mid-latitude westerly flow after it crosses 30N as it begins to undergo a sharp recurvature. The models vary tremendously on how quickly Karl will recurve by day 5, with the GFS-based guidance whisking the cyclone rapidly northeastward in response to a deep-layer trough moving through the northeastern United States and Atlantic Canada. The ECMWF and the majority of its ensemble members show Karl lagging way behind before being ejected northeastward by a slowly amplifying trough. The new track forecast is shifted to the left and is slightly faster through day 3, largely because of the initial re-positioning of the cyclone. After that time, a compromise between the much faster GFS-based guidance and the ECMWF results in a slower and somewhat more eastward forecast track. Karl can be seen approaching an upper-tropospheric cold low in water vapor imagery. The unfavorable juxtaposition of Karl and this feature should not result in much intensification for about the next 36 hours, since the flow over Karl is convergent and there is some deep-layer westerly shear. This is the rationale for keeping the short-term intensity forecast low. By 48 hours and beyond, the shear is forecast to have finally decreased while the cyclone reaches near 30 deg C waters, and intensification is likely. With the flow becoming increasingly divergent over Karl around the time it recurves in 3 to 4 days, the intensification could occur more rapidly than this forecast indicates, and there is some chance that Karl could become a major hurricane. Late in the period, increasing southwesterly shear could become a mitigating factor and the intensity is shown to be leveling off by day 5. The new NHC intensity forecast is a little lower than the multi-model consensus initially and about the same or a little lower at days 3-5. Wow! I have 2 dislikes for posting accurate information! Bermudians are truly amazing! Don’t take it personally – some people don’t like to read through paragraphs of data, even if it’s relevant or pertinent to the subject at hand. We are going to be a mess with all of the overgrown trees and bushes. Power will be out. Don’t know why Government and property owners have not maintained them. I once asked the Premier when something was going to be done about our roadsides. He blamed it on the rain. This has been going on for years. We don’t always have rain. PLP had the same problem dealing with our overgrown situation. Tourists don’t want to come here to see overgrown bushes that block their views while they are in a taxi, bus or bike. Can they BWS stop staying the closet point in the next 72 hrs will be on… I’m sure most people know what they are talking about…but some people believe when the say the next 72 hrs its coming on that day….I have to correct a lot of people about this….Some people even think the storm has passed as the day has come and gone giving them a false sense of security…..To make a long story short say it in Layman terms not like your speaking to other weather people!!! !